This beautiful poem is often chanted at Japanese weddings, as a symbol of longevity and harmony between married couples. Beautifully painted onto this uniquely textured and colored Japanese tea cup , this mug makes a wonderful wedding gift. With the symbolism of pines as an evergreen representation of longevity and the meaningful poem often recited in traditional Japanese wedding celebrations, this mug is the perfect gift for newly weds. With an elegant pale marbled green on the top and a sandy textured brown on the bottom, this Japanese tea cup is unique and perfect for hot tea, coffee, and hot cocoa. Textured on the top with raised dots, this cup is a unique and elegant way to wish newly weds a long and happy life together. Microwave and dishwasher safe, and packaged in a blue paper box, a pair of this Japanese tea cup is perfect for couples to curl and snuggle up to with a hot drink on cold nights. the cups themselves were beautiful. 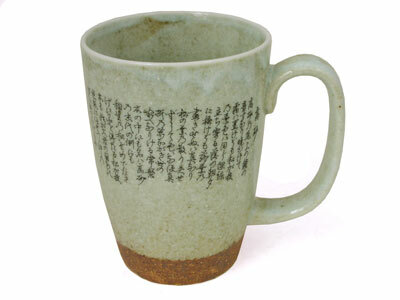 It would be nice to have a translation of the Japanese wedding poem on the cup. Consno translation of the Japanese wedding poem.